I read my fair share of Archie comics growing up, but I didn't realize how unintentionally sexual many of the covers and panels were. This message board has some hilarious examples, and not only from Archie. Here's one particularly creepy page from Archie. Yikes, that's pretty gay! Bolches yarboclos, stay out of Riverdale! 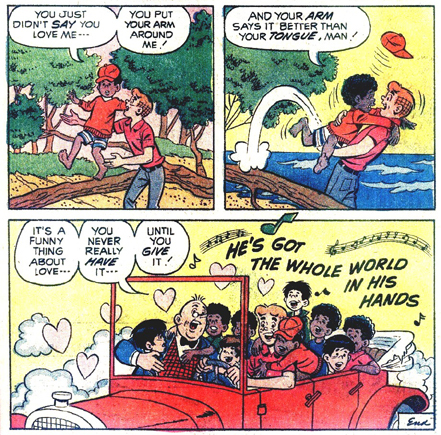 inadvertent homoeroticism going on in the pre-Kevin Keller Riverdale! !